Whether you’re planning a formal sit-down meal or a casual cocktail style party at home, we’ll have a chair to suit you. Wooden cross-back dining chair, solid wood, European construction, sustainable timber. Light oak colour. These are very popular as they are so comfortable and look great with most styles of furniture. 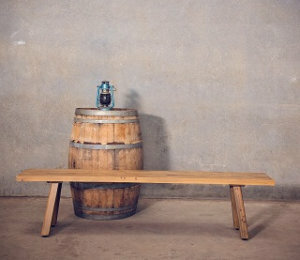 Especially gorgeous with our wooden pallet trestle tables. Vintage mismatched wooden dining chairs. Around 80 available. Some are very sturdy but others in the more vintage style have a 90kg weight limit. Walnut wood Tiffany dining chair (also called Chiavari). Detachable cushion in black or white available for each chair. Dark walnut solid wood dining chair in the classic Bentwood style. Elegant, formal and gorgeous. White resin Tiffany dining chair. Detachable cushion in black or white available for each chair.